Paul, John, Jim, Andy and Brian: Smiles all around! 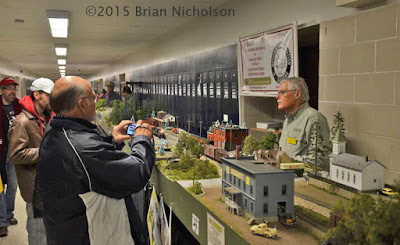 Paul Raham and John Johnston had their Marshall Station and Burnt River Siding modules set up along Andy Malette’s Brewery module and my Culverhouse Cannery module. 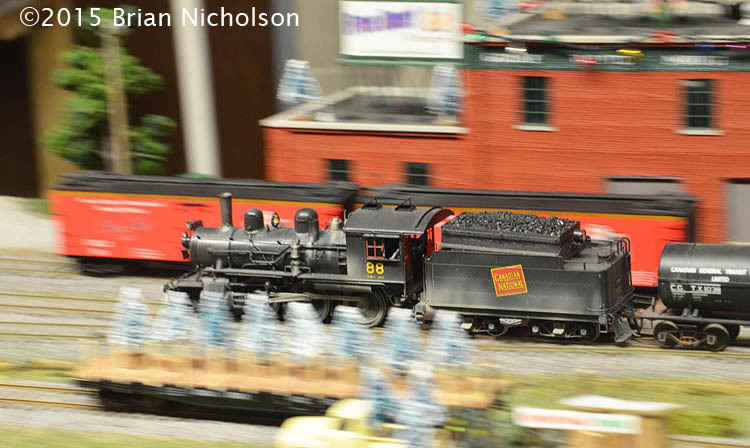 These, along with a train-length staging turntable, gave us a linear exhibit some 41 feet long. Paul Raham prepares to turn trains on the train-length staging turntable. Some of the other workshop members can be seen in the distance. 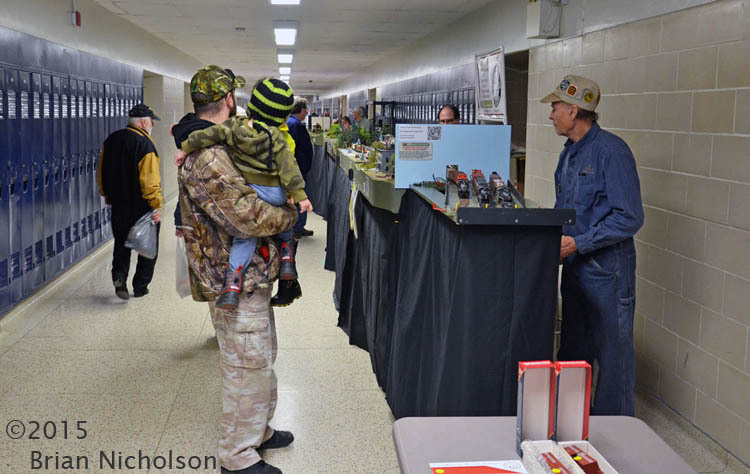 The hallway location was perfect for a long, narrow configuration and the layout received a lot of attention from show-goers. 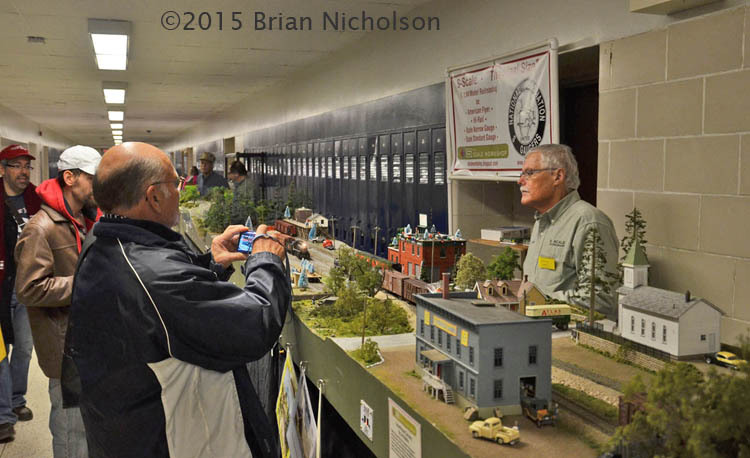 Vistors photograph the layout as Workshop member John Johnston rolls a freight extra through the Culverhouse Cannery module. The show was held in the Quinte High School in three different auditoria. However we were located in one of the hallways, a good thing because we were seen by everyone walking to and from the different halls. 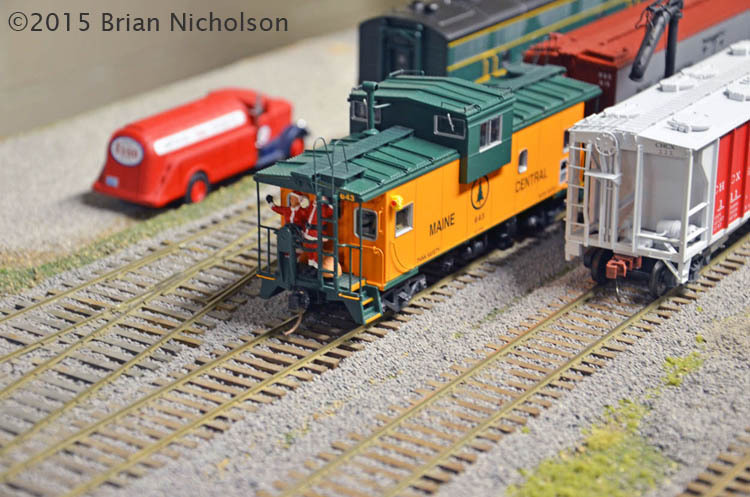 One of the Workshop's newest members, Brain Nicholson of Montreal, had a table beside us where he was selling off much of his HO equipment to finance his new S scale bug. It was good to see him again along with his partner Louise who was a cheerful addition to our group. Because this is a Christmas show we relaxed our fine scale standards a wee bit. Andy had his Christmas train with Santa and Rudolf and hoppers loaded with candy canes, along with a miniature Christmas tree lot. 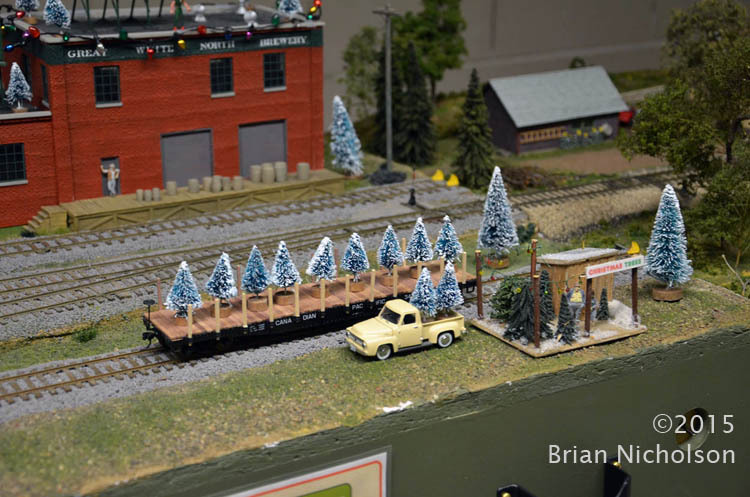 Of course Santa travels by Maine Central: "The Pine Tree Route". The annual appearance of Andy's Santa Special is always a crowd pleaser! The Jolly Old Elf is the conductor - but who is the engineer? 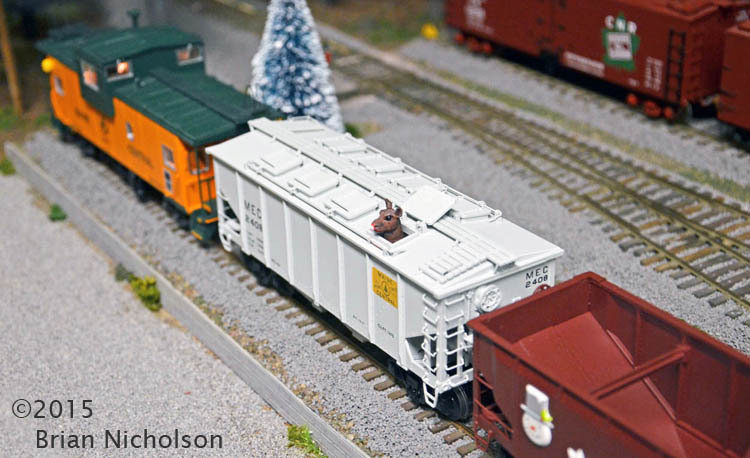 A flatcar load is delivered to the seasonal tree lot across the tracks from the Great White North Brewery. The brewery is decorated for the holidays, too. A carload o' candy canes rolls past as Jumbo trumpets in the pasture. Coal in your stocking? Great - run a steam locomotive with it! Our next outings will be Copetown and Cobourg on the same March 5th weekend. This will be a first for the Workshop, appearing at two different venues at the same time. Such is the flexibility of Free-mo. John, who organizes the Cobourg show was unavailable for Copetown when its date was moved from February to March. So John and Paul will hold the fort at Cobourg while Simon Parent, David Clubine, Andy and I have committed our modules for the Copetown show. Copetown will be special for us this year as it will be the 20th anniversary of our formation and the tenth anniversary of our switch to Free-mo. In fact, our Free-mo layout made its debut at Copetown in 1996.